It’s with a heavy dose of irony that I admit that the largest proportion of beer I drink is industrial American lager. Much of this is attributable to the fact that my go-to after-work happy hour bar serves inexpensive buckets of Narragansett tall boys, but I can honestly say (without much irony) that I frequently enjoy drinking cold, effervescent, dry, and nearly flavorless adjunct lager. I am a firm believer that there is a beer for all occasions, and this is especially true for adjunct lager. 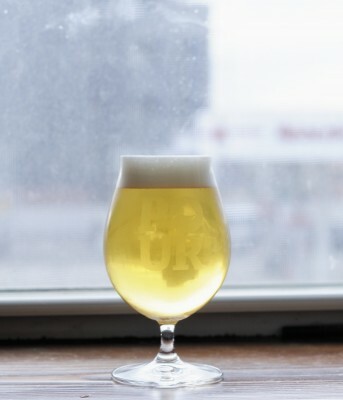 The fact of the matter is there are very few craft breweries producing any sort of light American lager so when a situation calls for this type of beer, I am often reaching for an industrial macro lager. Whether it is the economics of tying up tank space or a reaction against Big Beer, it is somewhat sad to me that no one is taking up this style. The closest thing that can be found are cream ales or ‘blonds’; often feeling like they want to be an adjunct lager, but are too self-conscious to describe themselves as such. It’s along these lines that I brewed the recipe below—essentially an ale version of Budweiser with a little extra gravity and flavor. I really enjoyed drinking this beer, and apparently so did the judges at the National Homebrew Competition who gave it a second place ribbon in the first round. Overall, the aroma is very muted. Malt is apparent with just a hint of bready pilsner character and a touch of graininess. There is a very low pear ester that reminds you this is an ale fermentation. I find a touch of corn in the aroma which I doubt I would have noticed it if I hadn’t brewed the beer myself. Surprisingly, there is a touch of herbal hop character that comes through against the generally muted aroma. The beer strikes a very light straw hue with just a hint of haze. The beer is capped by a big white frothy foam with moderate to low persistence. The beer is exceptionally clean with a very minimal malt character—just a hint more flavor than the beer’s adjunct lager cousins. There is a very low bready malt component that finishes with a touch of sweet corn and grainy husk. There is a very low bitterness, just enough to balance the slight sweetness attributable to the flaked corn addition. Overall, the beer is exceptionally dry, clean, and refreshing. This is an exceptionally lean beer with a spritzy level of carbonation. The beer finishes perhaps a touch watery, but not less than the style would dictate. This is a great quenching and dry beer with enough snappy carbonation to make it very refreshing. A tall pint of this would be a great choice for hot summer days when you’re looking for a light lager, but want perhaps a touch more flavor. This entry was posted in Homebrew Recipes and tagged ale, american beer, beer, cream ale, homebrew, homebrewing, national homebrew competition, recipe, review by Nick Ladd. Bookmark the permalink. Going to give this a go in the next few weeks. I’m testing out a few lighter beers for a friend wedding rehearsal dinner. Thanks for sharing. Awesome! Hope it turns out great!